In life, everyone needs an edge! When you have the edge, nothing can stand between you and success. It’s that kind of edge that makes champions out of us all. When we have the champion’s edge, defeat is not an option. And with the Champion’s Edge line of nutrition and performance products, you will experience an invigorated drive, a relentless pursuit of excellence, and an insatiable appetite for achievement. Experience the edge of a champion today! Experience Champion’s Edge! Champion’s Edge features a complete line of performance products that allow you to get an edge on whatever obstacles life throws your way. Our MentalEdge product provides you with a healthy energy boost and an enduring energy that will allow you to achieve your goals and power through your day. When it’s time for physical activity, our HydrationEdge product keeps your body going by replacing lost fluids and preventing dehydration, all while increasing performance and endurance. And when your activity is complete, RecoveryEdge restores energy and rebuilds and repairs muscles so you can bounce back quickly and provide your muscles with the nutrients they need. 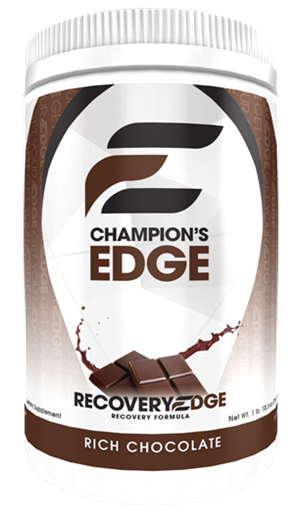 Champion’s Edge products are healthy and packed with essential nutrients that nourish your body. They not only provide energy, hydration, and recovery assistance, but they also allow your body to naturally rejuvenate and produce its own energy during and after physical activity while fending off free radicals that breakdown muscle tissue and damage cells. Our made-in-the-USA products are healthy and formulated for all ages. Unlike many of the leading convenience store energy and hydration drinks, Champion’s Edge products are low in sugar, low in carbs, and full of essential nutrients. All caffeine included in Champion’s Edge products comes from natural sources.Champion’s Edge products also contain no artificial colors, flavors, or stabilizers and contain no high fructose corn syrup. For performance products that are healthy and scientifically formulated to provide an enduring energy, allowing you to maintain peak performance levels for longer, there is only one choice – the choice of champions, Champion’s Edge! When you are mentally sharp, nothing can stand in your way. Whether on the field or in the boardroom, MentalEdge will provide you with the focus and energy you need to accomplish your goals and outperform the competition. MentalEdge can be used throughout the day – in the morning as a coffee or soda replacement, in the afternoon to help sharpen your focus and get you through your day’s activities, and prior to your workout to give you the edge needed to perform at your optimum level for an extended period of time. No artificial colors, flavors or stabilizers! DIRECTIONS FOR USE: Thoroughly mix one scoopful (10g) of powder into 8 fl. oz. of water and drink immediately prior to physical or mental exertion. May consume up to three servings per day whenever a boost in mental and physical energy is desired. Don’t rely on those convenience store sports drinks packed with sugar and sodium to keep you hydrated during your workout. Instead, use HydrationEdge to prevent dehydration and cramping by quickly replacing fluids lost during physical activity. HydrationEdge allows you to sustain enhanced and lasting physical activity for longer periods of time, and our proprietary energy mix increases aerobic and anaerobic performance and endurance. And, unlike those store-bought products, HydrationEdge’s low-sugar formula helps you maintain normal blood sugar levels, providing a more steady energy throughout your workout. DIRECTIONS FOR USE: Thoroughly mix one scoopful (10g) of powder into 8 fl. oz. of water. Drink before or during physical activity to maintain proper fluid and electrolyte levels in the body. After an intense workout, it’s critical for your muscles to recover properly in order to be ready to perform optimally the next time you push the limits. But make no mistake, all recovery products are not created equally, and RecoveryEdge is out to prove that fact. RecoveryEdge is precisely balanced for efficient and effective muscle recovery and its active ingredients meet the FDA’s and USDA’s highest quality standards. RecoveryEdgewas developed with you in mind, combining the very best ingredients with scientific innovation to provide your body with the nourishment it needs to bounce back quickly and give you the Champion’s Edge. DIRECTIONS FOR USE: Thoroughly mix 1 level scoop (50g) of powder into 8 – 10 fl. oz. of water and consume the entire serving. For best results, this product should be used immediately after physical activity/exercise/performance is completed.